Why I love to install waterfeatures in Gardens. 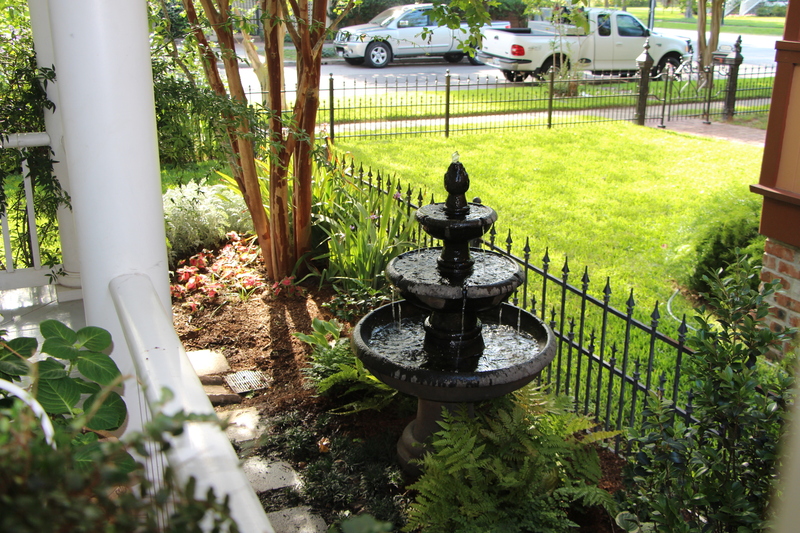 Our fountain right off the porch, so you can swing, watch the world go by and relax! 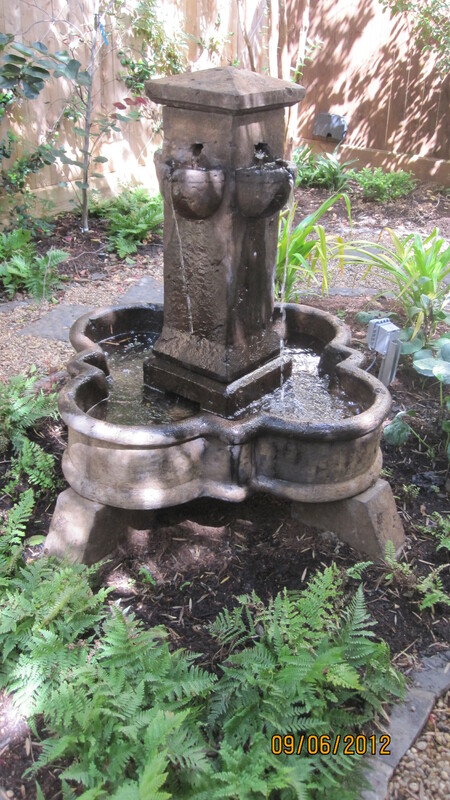 A garden should be a place to retreat from the stresses of the world you live in…the sound of water flowing from a fountain has a soothing effect that helps us still our minds and relax our bodies. We are attracted to water and it is necessary to our existence. We love going to oceans, streams or lakes when vacationing. 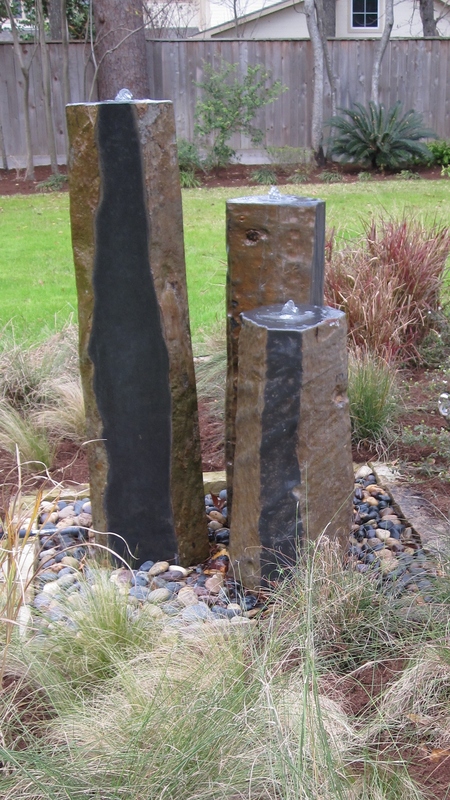 A trio of fountains made out of rock surrounded by ornamental grasses. Water features bring an added dimension of sound and movement to our gardens, making them a place for relaxation and contemplation; bringing a sense of tranquility. In our garden the sound of water can help block out the harsh sounds of traffic, televisions and A/C which wear on our nervous systems. This trio of fountains is from Buchanan’s Native plants here in the Heights. 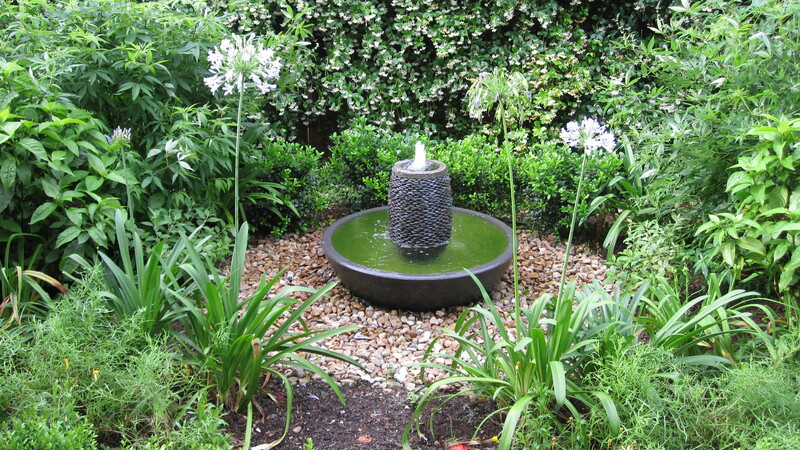 A water feature will draw wildlife into the garden. Birds love running water and will drink and bath allowing you to enjoy viewing them and they will in turn help control insects and help pollinate your plants. Water gives a sense of spaciousness in its reflective quality and makes your small garden seem larger. I designed this garden for a couple of birdwatchers. A fountain can bring visual interest as a focal point adding accent color, texture and architecture. Fountains are constructed out of a variety of materials from stone, ceramic, cast concrete and copper. 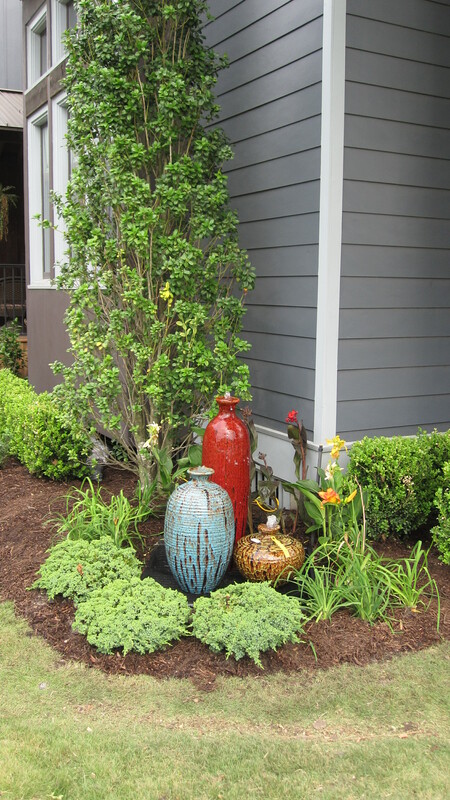 In Houston we have many excellent sources; something for every type of garden and personal style. A nice focal point in a shade garden. Here are my favorite sources of fountains in Houston.